Here’s one you may not have heard: how Shoeless Joe Jackson was briefly turned into America’s most-scorned draft-dodger in World War 1. 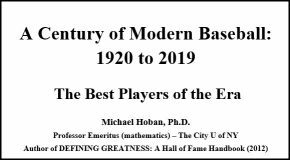 It’s true, but as with all Shoeless Joe stories, some work is required to separate fact from myth. It also helps to read published reports from his contemporaries, to view everything in the context of the times and to be aware of other forces which were at work. 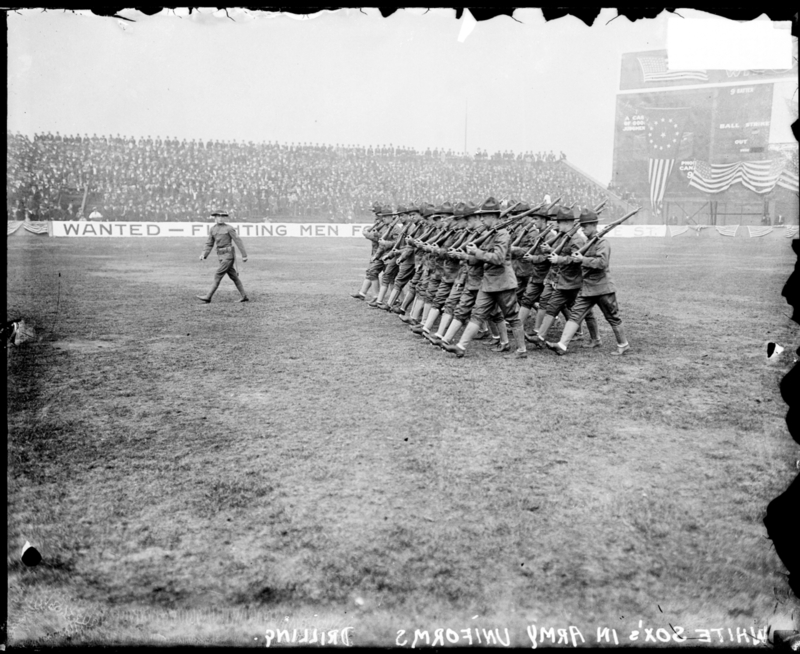 The War began in Europe in July, 1914 but had little effect on baseball in America the first few years. The 1916 season had been both successful on the field and profitable for the owners. Business was good. But things would soon be changing. The United States declared war on Germany just days before the start of the 1917 season. 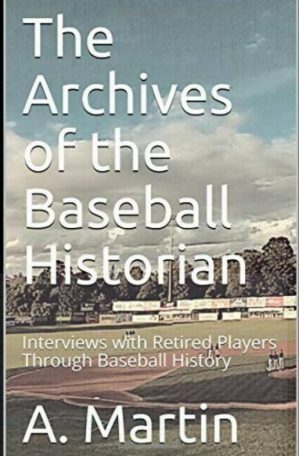 Initially there was talk of shutting down baseball–a thought that mortified owners, who understandably did not want to lose their businesses. White Sox owner Charles Comiskey was especially unhappy at the prospect. He had invested heavily to build his championship-caliber team (he spent his money on obtaining players, not necessarily on paying them). 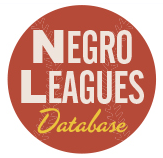 His star hitter, Joe Jackson, had been acquired from Cleveland in 1915 in a deal described as worth $74,000–$31,000 in cash and 3 players who had cost Comiskey $44,000–one of the most expensive deals of the time. Outwardly eager to help the national cause, baseball owners made a great show of their patriotism. They donated cash and rounded up baseball equipment for soldiers to use in their spare time. Exhibition baseball games were played for the benefit of the Red Cross. Special enlistment booths were set up at American League parks. Players went through military marching drills in pre-game ceremonies. There was even a prize for the best drilling major league team. And thus in May, 1918 Provost Marshall General Enoch Crowder issued the famous “Work or Fight” order, stating that every healthy male between the ages of 21 and 30 must find “essential work” by July 1 or face military conscription. The wording of the order was particularly chilling for baseball owners. It included a list of employment which was regarded as nonessential to the war effort: “games, sports and amusements, excepting actual performers in legitimate concerts, operas or theatrical performances.” Baseball owners were suddenly aware that they needed to round up some guys who could not only hit .300 and play the field, but do so while wearing a Viking helmet and belting out a rousing falsetto. But since such men were in short supply at the time (alas, they always seem to be), other arrangements needed to be made. Initially owners tried to get special consideration for their able-bodied players. While the government in Washington indicated that they hoped the game would go on, if it could be accomplished “in harmony with the great purpose of putting winning the war first above everything,” and Crowder released another statement within a week suggesting that ballplayers would be considered by draft boards on an individual basis, it became clear that a great many ballplayers would be leaving their teams. Overall, an average of 15 players would be lost per team in the 1918 season. Which brings us to Shoeless Joe. In 1918 Joe was 30 years old and had completed seven major league seasons with a sparkling .352 lifetime batting average. He was considered to be the second best hitter in the land (some thought the best at purely swinging the stick as Ty Cobb usually bunted enough to get more than the five or so hits per 500 at bats that gave him the roughly ten point lead in average, whereas Joe bunted about as often as he read from The Complete Works of William Shakespeare). 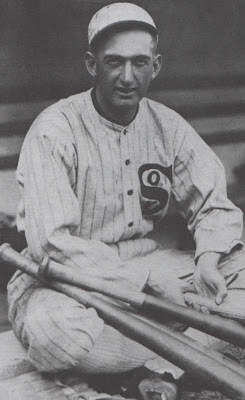 In 1917 Joe had hit .301, the worst average of his career, but he had helped to lead the White Sox to the World Series title (he hit .304 in the Series, not bad, but not as good as the .375 he would hit in the more famous Series two years later). As a great hitter and key member of the World Champs, Jackson was one of the game’s most famous personalities. But he was also one of the most difficult for fans and writers to figure out. His very existence seemed to be an amalgam of assorted tall-tales, half-truths and outright lies. Joe himself did little to clear up the confusion when interviewed or spotted on the street. In a 1916 profile for Baseball Magazine, one of the pre-eminent early baseball writers, F. C. Lane, wrote that “The oddest character in baseball today is that brilliant but eccentric genius, Joe Jackson. . . To sum up his talents is merely to describe those qualities which should round out and complete the ideal player. 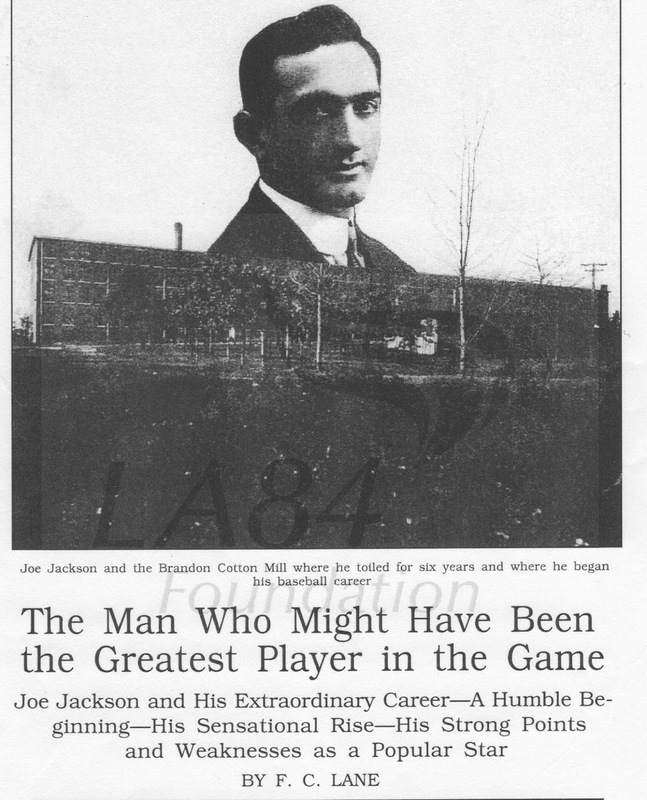 In Jackson, nature combined the greatest gifts any one ball player has ever possessed but she denied him the heritage of early advantages and that well balanced judgement so essential to the full development of his extraordinary powers.” And that lack of early advantages and well-balanced judgement would prove to be very important to Joe in the years to come. 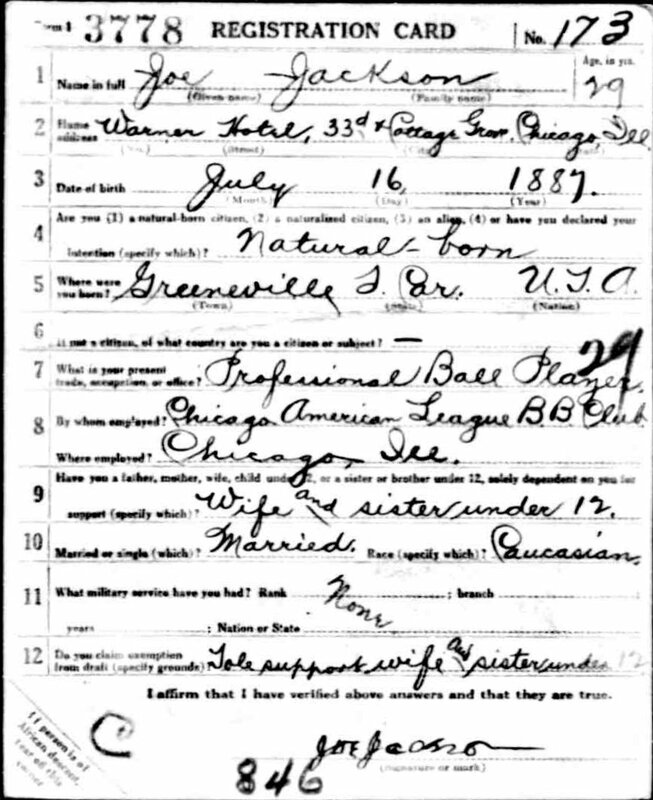 By the spring of 1918 three of Joe Jackson’s brothers had already volunteered for military service. Joe was the sole supporter of his wife, Katie, his mother, a younger brother and a sister. Because of this, the Greenville, South Carolina draft board had placed him in Class 4, making him safe from the draft. After 17 games of the 1918 season, Joe was hitting .354. The White Sox were in Philadelphia for a series against the A’s when Joe received a dispatch informing him that the Greenville draft board had reclassified him 1-A. He reported as ordered to the Philadelphia examining board, passed with a perfect mark and was told to expect orders to leave for an army training camp within the next two weeks. When the White Sox departed for Cleveland the next day, Jackson was nowhere to be found. He soon turned up and announced that he had found a position of employment with the Harlan and Hollingsworth Shipbuilding Company, a subsidiary of Bethlehem Steel, in Wilmington, Delaware. Work in the shipbuilding industry was considered essential and thus exempted Joe from military service. The news did not play well in the national press. While many other players were avoiding combat by playing on ball teams in industry and the military, Joe Jackson, the most prominent of the early names, was singled out. In the same issue, American League President Ban Johnson “leveled a solar plexus wallop at the baseball slacker.” Johnson, who hated Charles Comiskey’s ample guts and loved nothing more than a chance to knife his enemy when he was vulnerable, to publicly humiliate him, derail his business and maybe cost him a player or two, announced a warning to players seeking to avoid conscription. He told the writer he would like to yank back by the collar those who entered employment with the ship construction business particularly. Johnson left little doubt this was specifically in response to Joe Jackson’s status. Johnson would soon announce that hereafter athletes would have to stick with their clubs until the final Government call, and then go straight to war-service. That was only the beginning. A scathing editorial soon followed in the Chicago Tribune entitled “The Case of Joe Jackson.” Joe, a man of “unusual physical development,” who “presumably would make an excellent fighting man,” was excoriated and branded a coward and shirker. According to some sources Charles Comiskey had initially encouraged his players to try to find exemptions to remain playing for the White Sox as long as possible. Always careful of the winds of public opinion, however, he now pompously joined in the scorn of Jackson. Comiskey was shocked (shocked!) that one of his beloved employees would even think of trying to avoid military service in this time of national need. “There is no room on my club for players who wish to evade the army draft by entering the employ of shipbuilders,” he told reporters from atop his soapbox. The great man was so disappointed, he threatened to not take the “jumpers” back after the war. Skeptics to Comiskey’s pure intentions would later point out that while this posture kept him on the side of patriotism and duty, it also prepared him for future player negotiations, well aware that a man who thinks he is not welcomed back (and has no other employment options due to the reserve clause) is much more pliable at the contract table. 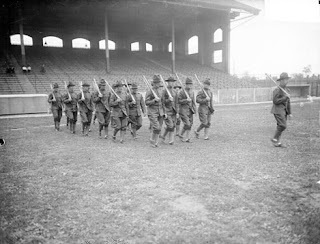 It soon became apparent that the thing that truly rankled Comiskey was not that Joe Jackson was shirking his duty to his country by not carrying a rifle, but that he was doing so while playing baseball for someone else; and doing so while Comiskey’s team was certain to fall in the standings. Owners were outraged that fans (people who should be paying money to them!) were going to see baseball stars (who used to belong to them!) play for someone else. Through it all, Joe uttered not a word of public comment or protest against the accusations. A solitary writer in the Sporting News offered some defense for Joe, stating that there was something unfair in the Greenville draft board decision. “I can’t understand why Jackson was placed in Class One-A. There are many stars of the big leagues who are married and have many times the amount of wealth Joe possesses who are in Class Four.” It appeared the Greenville decision was made to give a great show of not offering favoritism to a famous athlete or perhaps as the result of a personal grudge. 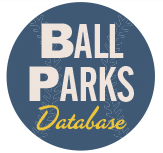 Despite the public outcry, work by the ballplayers at the shipyards continued throughout the war. How much work was done and how much baseball did the guys actually play? It’s anyone’s guess. For the record, they did play a lot of baseball. 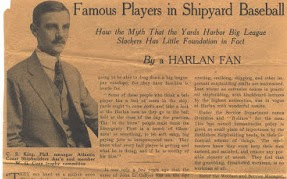 But a foreman at the ship yard told a reporter, “The boys in the yard all knew they [the ball players] were married men and hence not attempting to duck the draft and they warmed up with them right away when they observed that they meant business. . . and they weren’t handed any soft jobs like watchmen . . . they do a good day’s work.” He added that they only went to the ball field at the close of the work day. And much good came out of the ballplaying. They played a series of exhibitions for the Red Cross. One at the Polo Grounds, with Joe as the headliner, raised $6,000. Joe’s wife would keep in her scrapbook a letter from a Reading, Pennsylvania organization thanking him for drawing 10,000 fans to a benefit. The tumult over Joe soon faded from the public’s attention as much more pressing matters arose and attention turned to the actual fighting in Europe. As for 1918, it turned out pretty well, Joe Jackson was the star of the Steel League, hitting a robust .393. Harlan won the championship–Joe hit two home runs in the title game–and, oh yeah, we won the war, which is always nice. 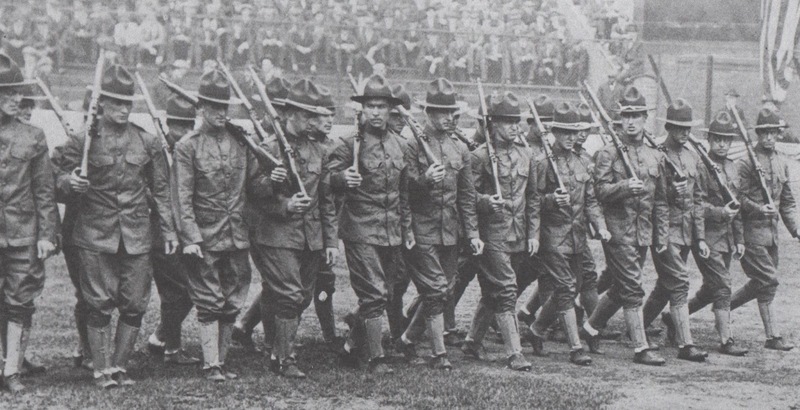 So everyone was in good spirits and ready to get back to baseball business as usual for 1919. There was only the small matter of rounding up the players. When the 1918 season had ended early on September 1, the owners had released all players, saving around $200,000 they would have otherwise spent on those pesky salaries. 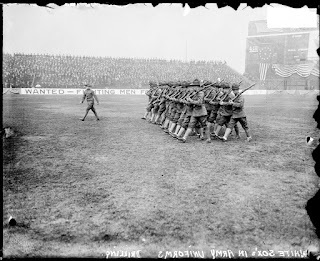 Amazingly, the next spring every single player–technically all free agents–signed back with their original team for 1919 (66 years later this practice would be labeled collusion and would cost the owners millions in a court settlement, but at the time a players union was as inconceivable as another, larger World War ever occurring). Early in 1919, Comiskey, that gentleman magnate, let it be known that Joe Jackson had been reinstated to his team. What with the war being won and all, opinions had changed and the big ol’ lovable Roman was willing to let bygones be bygones–especially for guys who could hit .350 in their sleep and were willing to do so for a pittance. He signed Joe back for the same $6,000 a year he had been making since 1914. Joe Jackson and his White Sox teammates quickly proved to be the best in baseball in 1919 as they stormed toward the pennant, and a date with infamy. So all the ingredients were there: the avarice of owners, the unrelenting drive of organized baseball and writers, working side-by-side, to maintain the proper image at all costs, sacrificing a few players if necessary, the cut-throat rivalry between Ban Johnson and Charles Comiskey, and then the players, plugging along on the field, unable to control their own destiny. Shoeless Joe Jackson, the great misunderstood slugger from Greenville, South Carolina, whose legacy would be still provoking emotional debates a full century later, was, as so eloquently put by Mongo in Blazing Saddles, only a pawn in the game of life. Unfortunately for Joe, it wouldn’t be the last time. First game back at Comiskey Park 1919 The fans welcomed him back. I don’t see where the fans were ever against Jackson as you mentioned. It is true the press did not care much for him from the very start of his career, mainly because of his illiteracy and that he would not communicate with them. Game 8 – Friday, May 2nd – Just to show that they know how to look fashionable in baseball the St. Louis Browns crabbed what the weather man has of the glad inaugural doings on the south side by licking the White Sox today 11 to 4 in the opening game of the American League season here. There was no doubt about the licking nor any alibi for it. The Burke tribe outplayed the Gleasons at every angle and knocked our first string pitcher Claude Williams, off the mound in the second inning, besides clouting our esteemed boss finisher, Dave Danforth with considerable abandon. The inaugural ceremonies were run off without a hitch in spite of the twenty hours delay. Featuring the festivities was the dedication of a spick and span new United States flag with the aid of a squad of marines under the leadership of First Sergeant Meidle. Just before the scrap the marines headed by a band, marched around the field carrying the Stars and Stripes and followed by the White Sox and Browns in “fatigue” marching order. 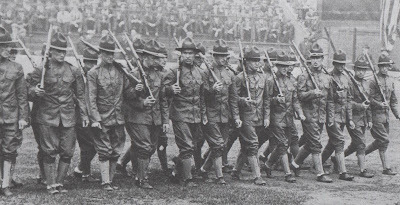 Ed Trowbridge Collins, captain of the team, who enlisted in the Marine Corps at the end of last season, marched in the first rank of the color squad as it bore the outspread flag to the pole in left field. While it was raised the band played the national anthem and the crowd of 12,000 fans stood bareheaded and applauded. There was a rival band representing the “Joe Jackson Rooters” from the stockyards which aided in the entertainment and there were presentations for the athletes which included a gold watch for Jackson and a real leather travel bag for Ray Schalk. These preliminary doings were about all the joy there was in the game for the home rooters. The Browns started right in on Williams and scored a run off the reel, scoring five in the top of the second. Jackson led in the home second with a double to left center and reached third on a wild pitch. Felsch rolled a slow one to short, and it looked as if Gerber’s throw pulled Sisler’s foot off the base, but Hap was called out, while Jackson registered the first run. Gandil walked, Risberg lined to Tobin, then Gallia soared and passed Schalk and Danforth, filling the bases. But he came down in time to make Leibold hit to Sisler for the third out. Gandil’s homerun into the left field bleachers did a lot to cheer up the rooters. It came with two men out and Jackson on second in the sixth, but the Browns had already established such a large lead it made little difference.